Review of Finnnriver’s Black Currant wine with apple brandy. I was lucky enough to host a cider tasting at my house where some friends brought this rarity for us to try. Black Currant Wine Description: We believe there is an alchemy to making a fine fermented drink. First, sun, rain and soil work earthly magic to produce fruits full of possibilities. Then we handcraft our fruit wines by pressing, fermenting, and blending with apple brandy to bring forth the vital flavors of the fruit. We call these wines “fruit for grown-ups.” Enjoy sipped, as a sweet complement to dessert or as dessert itself! I tried it at room temperature, but I wouldn’t have minded it cold, or even, shocker, over ice (or maybe ice cream?). It tasted a lower ABV than it was, which could be dangerous. Tasting Notes: Semi-sweet. Intense black currant with blackberry and cranberry notes. Low acidity and tartness. No bitterness, sourness, or funk. Full bodied. Medium finish length. Closing Notes: Yum! What a special treat. Have you tried any Finnriver apple brandy products? What did you think? 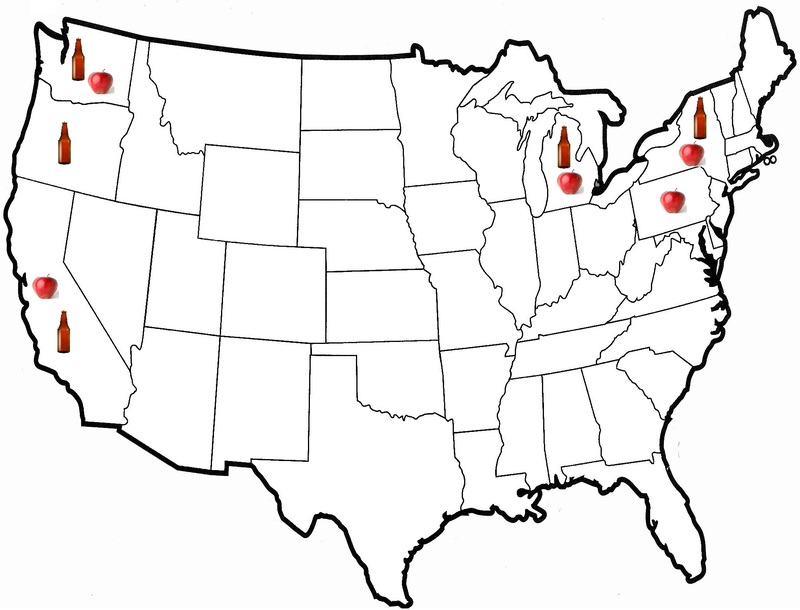 Lately I’ve been curious to learn more about the major cider regions in the U.S. The Pacific Northwest (WA & OR), NY, and MI (Great Lakes / Finger Lakes) come to mind. I was also surprised to learn that CA is a major cider producer, and PA is a major apple producer. Apples are grown commercially in 32/50 states in the U.S. It all started on the East Coast in colonial times. The top ten apple producing states in the U.S. are WA, NY, MI, PA, CA, VA, NC, OR, OH, and ID. Washington – Apples primarily grown in the Yakima valley, while the majority of the cideries are in the greater Seattle area. New York – Apples grown primarily in the Hudson and Champlain valleys, while many of the cideries are in the Hudson valley. Michigan – Apples grown primarily in the Northwest corner of the Northern Lower Peninsula and the lower half of the state, same as the cideries. Pennsylvania – Apples grown throughout the state, but comparatively there are few cideries. California – Apples primarily grown in the San Joaquin Valley, while many of the cideries in contrast are in Sonoma and Mendocino counties. When it comes to which state has the most cideries, the statistics get a bit murky. However, its pretty clear the top five in some order are NY, WA, OR, MI, and CA. The stats are further complicated as some wineries, breweries, and even meaderies make cider. Thats not to say cider isn’t available from cideries in other states. Many have numerous cideries. PA, CO, VT, NC, MA, NH, and VA come to mind. Its also difficult to look at it by state as the populations & landmasses vary so much. However, demand for cider is definitely skyrocketing, and new cideries are opening every week. Cider grew 70% each of the last two years! Cydermarket is a very cool website with a directory of cideries by state. Availability: year round (since 2010); widely available in OR, WA, & CA, and less so in ID, MT, MI, UT, IL, NM, NJ, TX, ID, TN, PA, VA, & WA D.C. Description: Anthem Cider offers the tart acidity of the apple’s natural malic acid with a clean fruit forward finish. 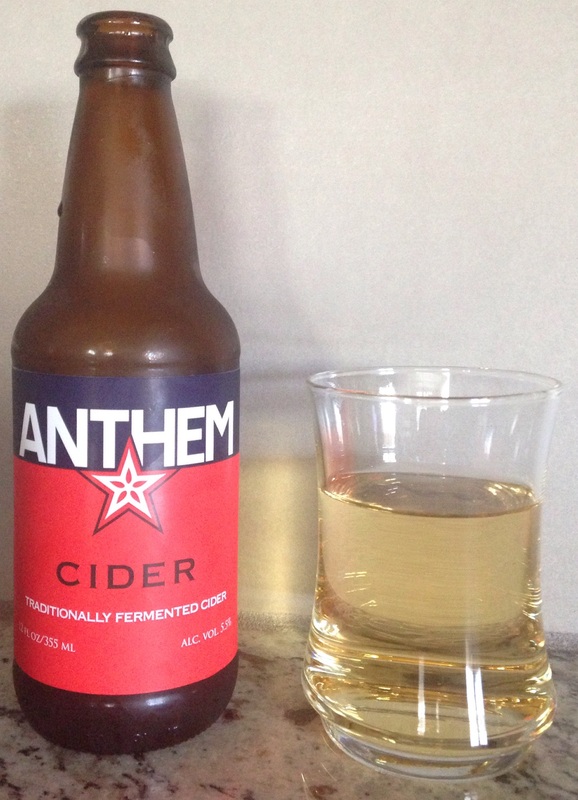 Anthem Cider is the foundation for all the Anthems. Semi-Dry. Medium Tart. We only use fresh pressed apples and other fruits, herbs sourced from the Pacific Northwest of known varieties – they are listed on every bottle and keg. To make great real cider, the varieties of apples, fruit additions and herbs matter. As does where the ingredients are grown and how far removed they are from their original form (degrees separated through processing from the farm to the bottle). The fresh pressed apples we use provide all the sugars for fermentation and the malic acid (source of the tartness). Any and all residual sweetness in Anthem is provided by the apples we started with or the fruits we finish with. The result is a line up of real ciders made the way you expect; apples pressed and fermented. Cidermaker’s Description of Anthem vs. Wandering Aengus: Wandering Aengus Ciders are made from heirloom cider apple varieties that have traditionally been used over the centuries for ciders in French, England and pre-prohibition America. We grow these rare heirloom apples ourselves in Salem and have a handful of growers around Oregon that grow for us. These heirloom apples are pressed only once a year. The apples for Anthem are pressed and fermented year round from the common apple varieties that are grown on a large scale in Washington and Oregon. Anthem Cider is also finished with fresh pressed juices of other fruits or hops while Wandering Aengus Ciders are not blended with other fruits. Opinion: My first impression is this cider’s dry plain apple scent. My nose did not deceive me this time. Anthem Cider is described as a semi-dry cider, and I would mostly agree…I’d put it smack between semi-dry and semi-sweet, which may appear to a lot of folks as there isn’t much available in this sweetness range. The flavor was a bit “blah” for my tastes…it doesn’t have much complexity going for it. Even if it has been slightly sweeter (as my tastes tend that way), I still don’t think I would have been impressed. The most similar cider I’ve sampled is Seattle Cider Semi-Sweet, which has a similar sweetness and flavor. However, I think I’d have to give Seattle Cider the edge in the comparison, as it is a bit more clean & refreshing. I remember having the Seattle Cider on tap with some fish & chips awhile back and it was tasty, but drier and more plain of a flavor than I prefer. Overall, I found Anthem Cider to be fine, but not impressive. Closing Notes: Anthem also offers pear, cherry, and hops varieties. I was surprised to find that most Anthem Cider reviews online are of their Hops variety. Note that each Anthem batch is slightly different based on what apple varieties they used (based on availability due to the time of the year), and their website will even tell you what is in a certain batch. I sampled batch 127, which was a blend of red delicious, gala, granny smith, pink lady, jonagold, & opal apples. Their approach seems unique, as most other cideries will name a cider different if there is a significant variation such as this (or clearly note a vintage). Have you tried any Anthem ciders? What did you think? Description: Our flagship apple cider is a celebration of the Northwest. The fruit forward apple aroma and taste come from a tailored blend that perfectly balances the sweetness, tartness, and dryness of the fruit. A clean finish from the use of all fresh regional juices reminds us that this is an authentic hard cider. Enjoy this natural, semi-sweet, and bold cider from Bend, Oregon that simply brings out the best of the Northwest. Opinion: My first impression is the dry smell. It is pale and bubbles very little upon pouring. Upon tasting, the flavor reminds me of sweet sparkling wine, with a hint of pear & honey. There is an effervescence feel, although it is not highly sparkling. I was surprised how well my nose deceived me into thinking it would be dry, but it is not; I would call it semi-sweet. This cider is very smooth and well balanced. I would not however describe the flavor as simple, which can often happen with plain ciders. This cider is easy to drink and tasty. I snacked on some cheese & crackers while drinking it, which was a nice combination. This is a refreshing cider for any time of year, but for summer especially it is nice. Atlas was started in 2013 by a husband & wife duo. They also offer Pomegranate-Cherry, Apricot, and Blackberry varieties. Have you tried any ciders from Atlas? What did you think? Do you have a tough time finding a good selection of hard cider while out on the town at restaurants, bars, and events? Even in the Seattle area, I often do. Many chain places only carry Angry Orchard Crisp Apple. I wish more places at least offered Woodchuck. 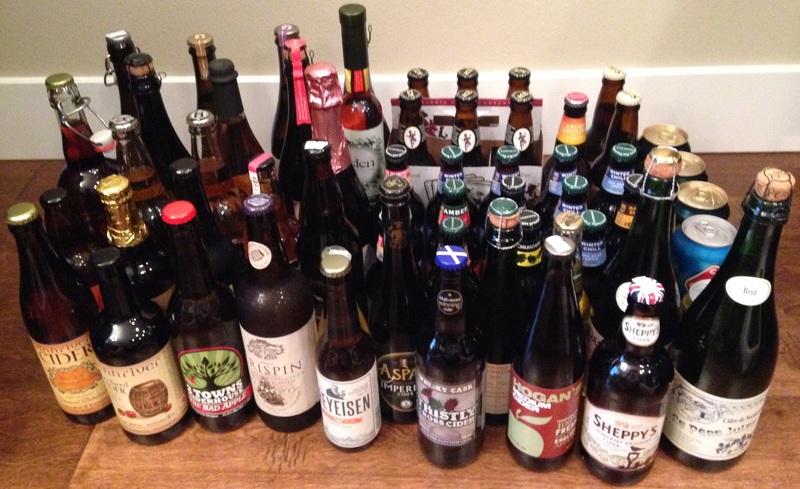 Here are a few times I’ve been lucky enough to find a good cider selection. Tipsy Cow Burger Bar, in Redmond. They have two cider taps, which had d’s Wicked Baked Apple (from Kennewick WA) and Spire Mountain Dark & Dry (from Olympia WA) last time I was there. I chose one of my favorites, Spire Dark & Dry, which was even better on tap than bottled. Plus, their food is awesome, and I even eat veggie burgers. Tavern Hall, in Bellevue. They have two cider taps, which had Seattle Cider Semi-Dry (from Seattle) and Rev Nat’s Revival (from Portland OR) last time I was there. I chose one of my favorites, Rev Nat’s Revival, which was also better on tap then bottled. This is a tropical fruit flavored cider, with which I pick up a lot of pineapple & mango. This place has a great atmosphere. Hubby and I ended up hanging out at the bar for a few hours chatting up the bartender. Didn’t try any food, but their menu looks awesome. Big E Ales, in Lynnwood. This is a beer brewery which offers a couple bottled cider selections, Sonoma The Anvil (from Healdsburg CA) and Anthem Pear (from Salem OR) last time I was there. I chose the Sonoma Anvil, their bourbon flavored variety, which I had before but had forgot how good it was. It was a fun atmosphere and they have a yummy bar food menu. I was surprised how busy it is despite their odd location in a warehouse district, but it appears they have a loyal following. Black Raven Brewery, in Redmond. This is a beer brewery which offers a few Finn River bottled cider selections (from Chimacum WA). I chose the Black Currant, which I hadn’t tried before. It was very fruity & tasty, almost tasted “grapey” to me (in a good way), and was a good mix of dry & sweet. Black currant is an unusual cider flavor, but they did it well. They have a fun atmosphere. There is often a food truck, or else many restaurants will deliver here. Tap House Grill, in Bellevue (also has a Seattle location). This restaurant has 6 cider taps, ranging from ordinary to local. I tried Wandering Angus Wickson (from from Salem OR) when I was here, which was way too dry for me. Bad on me for choosing something at random (because I hadn’t heard of it) instead of looking them up or even just walking up to the bar, after the waitress had no clue about their cider selections. They have ok food. We mainly went here due to the location, within walking distance of everything in downtown. Capitol Cider, in Capitol Hill. This cider bar and gluten free restaurant has 20 cider taps, plus 250+ selections in their bottle shop. I went here quite awhile ago so I’m not sure how valid my info is anymore. However, I was surprisingly disappointed. We went at an odd time, Sunday at noon, so the place was pretty empty. I was expecting to get lunch, but they had a brunch menu, which didn’t have any interesting sounding lunch selections, so we ordered breakfast with our cider! At the time I went most of the selections on tap were really dry, and after the first couple tastes I coaxed out of the bar staff I just picked one, which also was too dry for my liking (don’t even remember what it is, so it must have not been very memorable). The waitress didn’t seem to interested in finding something I’d like. Their current tap selections look more well-balanced. I was excited for their bottle shop after reading about it online, but it turned out to be a list to choose from which they would pull the bottles for you. Hopefully that has changed, as half the fun is looking at & reading the labels. I ended up spending a bunch of time on my phone to make an educated selection. Hoping to give it another shot sometime, but in general this place just isn’t our scene. Schilling Cider House, in Fremont. I haven’t been here yet, but it is at the top of my to do list! Yes, I have my priorities straight. Cider first, then everything else. They have 32 cider taps, 250+ selections in their bottle shop, and food available from local restaurants which deliver. Their tap list is awesome, and includes a number of Schilling’s own varieties and many more, including some novelty/wacky stuff. They have a few of their own ciders on tap which they don’t offer anywhere else, such as their Berry cider. How have you fared finding good hard cider while out on the town in your area? Description: My newest release is Revival and I couldn’t be more thrilled to share it with you. I start with a secret blend of Washington-grown apples and add piloncillo, dark brown evaporated cane juice, purchased direct from Michoacan, Mexico. I ferment this dark base to all the way to dry using two exotic yeast strains: a beer yeast known for the round mouthfeel in Saisons and a rarely-used secret culture which produces aromas of pineapple, guava and peaches. This cider is brilliantly golden in color and deeply complex while remaining subtly familiar, with just the right amount of sweetness and acidity to be an everyday beverage. Opinion: This is an awesome semi-sweet cider with a unique tropical fruit aroma & flavor. Surprisingly the tropical aspect is all from the apples (dessert, not cider apples) & yeast, nothing else was added. I find this more semi-sweet than semi-dry, although apparently that is a suggestion from the tropical flavor, or as Nat West (Rev Nat’s founder) said, “It gives a perception of sweetness, while maintaining an semi­-dry character and rich complexity”. Revival also has a wonderful deep hue from the piloncillo. If you are lucky enough to find this flavor on tap, give it a try, as it is even better than bottled! Note there is a Rev Nat’s variety called “Revival Dry”, which is different than this one. I’ve also tried Rev Nat’s Tepache, which is a very unique beverage made from fermented pineapple and spices. I look forward to trying more Rev Nat’s cider, once I find one that interests me, as so far near me I’ve seen varieties with spices, hops, and ginger, none of which interest me. Rev Nat’s taproom also sounds like a fun place to visit, and they have had all sorts of events & special releases, so its on my short list. A unique cider from a unique cidery. Highly recommended! Have you tried Rev Nat’s Revival? What did you think?